A few nights ago I was stumbling home from Lauriol Plaza when I noticed that my neighborhood gas station at 18th & S magically transformed itself from a BP to a W Express. I’m sure we have all seen a BP (short for British Petroleum) station and maybe even seen one of their commercials on TV. They’re a huge global energy corporation right? Right. I’m guessing however that you probably know little to nothing about W Express. In fact, I tend to think of myself as a pretty good master of using the Google and the Bing, but I can’t find any information on W Express. None. So I have to wonder how a gas station changes hands from a global energy giant to what appears to be a local rinky dink company, who I might add has one of the worst logo designs I’ve ever seen. What does the “W” in W Express even stand for? Where does their gas come from and how good is the quality? Now I’m sure most people don’t have a preference of which gas company they use, but what if your local grocery store was a Safeway one day and then a “Q Speedy” the next? Would you still buy food from a store you knew absolutely nothing about? If you have any information about W Express or are better at Googling than I am, please share in the comments. Gas stations are franchises, owned and operated independently. So franchise owner gets tired of paying franchise fees, or having to buy their gas from BP instead of from whomever will sell it to them cheapest, and they terminate/don’t renew their franchise contract and re-name the station. Mid-Atlantic Petroleum Properties, LLC is the parent company of ” The Washingtonian Cafe’ and C-store, The W-Express Gas & Go which is a private brand of gasoline, Mid-Atlantic Petroleum Properties, LLC. The “W” stands for “Washington,” I believe. Thanks for the info, Greg. It’s a little scary to me that a company that sells gasoline has little to no information available to the public. Their website (http://www.mappllc.com/) is basically broken (all links lead to a 404 error). Almost no gas stations are actually owned by the company with its name on the sign. Instead, they’re franchises that the various oil companies compete for to have the rights to a.) sell to them, and b.) put their names up. The deals are generally very lucrative for the stations up front, as they include new signage, usually upgrades to the interior, etc, etc. However, they’re also locked into contracts to take deliveries from the oil company. That this went from a BP to whatever else just means that the sunset hit on the franchising deal. Very few stations will remain in an ongoing relationship with one franchise because it’s a better deal to jump around. That they’ve gone to an off-brand probably just means that it’s more lucrative for them to buy their gas from multiple suppliers to price shop. It also gives them flexibility to enter into a franchising deal when the offers are better. Now, the gas. In the US, in a given region, gas is gas is gas. The name on the front of the gas station has basically nothing to do with who refined that raw petroleum into gasoline. It just means that’s the company in charge of the delivery. For example, your local BP station might have taken delivery from a BP contracted truck that actually filled up on Exxon gas at a Valero tank at the rack that came through a 3rd party pipeline and was actually refined by Marathon from raw materials supplied by Shell through pipelines co-owned by ChevronTexaco. That would be perfectly normal. Most oil and gas companies do not even have access to their refined products everywhere they have stations — they’re all interdependent and activity trade among themselves and 3rd parties. That’s what speculation is all about. Additives, no matter what you read anywhere, make almost no difference whatsoever. Gas in the US is made in two octanes, and anything else is made by mixing the two and/or adding some marketed additives before it goes into the truck on its way to your local station. Other than the additives, gas is refined and sold according to defined standards that all must adhere to (there are regional differences, most clearly in CA, but within a region this is all true). So, any gas of one octane is just as good as that same octane at any other station. Brand names on the stations are just marketing. Wow, thanks for the insight, Dogwood – good stuff. There is a seasonal mix difference, which changes twice a year (before summer and before winter). When that occurs, the amounts of gasoline and the primary additives (common to all refiners, and currently primarily ethanol) are altered from summer to winter and back. This is for a number of logistical reasons, but it doesn’t impact octane. Additionally, it’s a common change among all producers. Gasoline is a commodity, which by definition means that it’s the same everywhere (save additives used for marketing). The important lesson: Gas is gas is gas. Buy the cheapest you can find. Just a tip – Marriott doesn’t own all those hotels, 7-ll doesn’t own all those convenience stores and McDonald’s doesn’t own all those restaurants. My original point was, “Who is W Express?” They still seem shady to me. But as Dogwood points out, gas is gas is gas. If the McDonald’s you frequented changed its name to “Mohammad’s”, changed its menu and employees overnight, would you be suspicious? I would be. McDonalds, while close, does not sell a fungible product. Burger King, Wendy’s, Checkers, and Bob’s House o’ Burgers are all similar but in some ways different. For instance, McDonalds could never get away with selling Whoppers instead of Big Macs if their stock ran low. Gas is not the same. If you get 87 or 93 octane gas at a BP station, Exxon, Citgo, or W Express, it’s all almost exactly the same, less any additives that station markets. (Mid-grades can be a little different because they’re made by mixing 87 and 93 together to get another octane, but 2 of the same octane are again the same.) To be clear, changing the name on gas would be as if all of the above fast food joints only served Big Macs, but they all put their name before Big Mac. The additives are the equivalent to that name change — they don’t really alter the product. 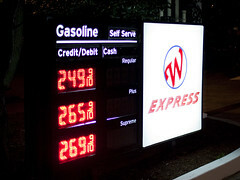 So, it can be called W Express, Shell, or Timmy’s Gas Depot, and the product is exactly the same. That’s the point of a commodity product. Gas is gas is gas. And it’s DO-GOOD, not Dogwood. Thanks.